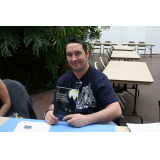 Author of The White Shadow Saga: The Stolen Moon of Londor, an epic fantasy. Founder of Fanda Books. The era of peace among the elves, men, and dwarves comes to an end when one of Londor's twin moons disappears from the heavens. Without the moon's balancing effect, evil forces grow bold, and warfare, sickness, and chaos threaten life itself. Hearing the prayers of desperation that ride on the violent winds, the ancient wizard Randor Miithra, servant to the elf-gods, takes it upon himself to mend the world he has sworn to protect. The task will not be an easy one, though, for the wizard, too, has begun to feel the effects of the world's imbalance. As Randor struggles to maintain some semblance of his powers, he meets a secretive band of colorful characters from all walks of life, drawn together by a common goal: to find the stolen moon, whatever the cost. It does not take Randor and his motley company long to see that someone or something does not want the moon returned to the heavens. The road is perilous...the stakes have never been greater...will they find victory...or will they only find their deaths? The Stolen Moon of Londor is an epic fantasy inspired by the great fantasy novels I read growing up. I also wanted a good amount of action in it, so think Lord of the Rings meets a kung-fu movie. If you enjoy an interesting plot, interesting characters, and some good action, I encourage you to give it a look.